Langtang valley trekking is short, popular and closest Himalayan Region that leads to beautiful trekking in Langtang. Langtang Valley Trekking journey follows along a serene river valley up to a plateau surrounded by peaks soaring into the sky. High Altitude Trek to Kyangin Gompa (3870 mt.). Magnificent views that include the entire Manaslu, Ganesh Himal, and Tibetan Mountain range followed by Langtang range. Beautiful villages along the way. Yak Cheese factories at Kyangin Gompa and Sing Gompa. Langtang Valley Trekking journey follows along a serene river valley up to a plateau surrounded by peaks soaring into the sky. The Langtang National Park has long been in the top three trekking destinations of Nepal after Annapurna and Everest region. It is a favorite region for very good reasons! This upper valley was formed by glaciers long ago and is a sacred ‘hidden valley’ according to the local Buddhist culture. As such it is regarded as free from the problems of the world and it really does seem that way! Along the way, you can view the breathtaking Himalayan splendor of remote forests and alpine meadows. The hike up the Langtang Valley is more moderate than other popular trekking regions and the rewards can be just as superb. The route passes through forests with rhododendron (Nepal’s national flower), as well as bamboo, birch, pine and eventually juniper. The trail passes by scenic waterfalls and local wildlife includes the Red Panda. Our ultimate destination of Langtang Valley Trek is a settlement known as Kyangin Gompa, with a famous monastery of the same name. Because of the monastery and location, this area becomes very active during important Buddhist festivals. Kyangin Gomba is also famous for a cheese factory and we will take the opportunity of a tour and sampling the locally made products. There is much to explore in these highland meadows with thrilling viewpoints that offer unforgettable panoramas. The trekking journey to the Langtang Valley begins with a scenic drive from Kathmandu through the hills with picturesque villages surrounded by terraced fields. We register our documents at the national park check post in Dhunche, a lofty town above the Trishuli River. We then continue by vehicle to Syabrubesi, a busy settlement at the meeting point of the Bhote Kosi River and Langtang River. From Syabrubesi we begin our Langtang Valley Trekking as we follow the flowing Langtang River up through the splendid landscape to Langtang village, a charming settlement populated mostly by Tamang people. We continue upward as the valley opens out to the uppermost settlement of Kyangin Gomba. We have a day to see the sights of this sacred valley before making our way back down the valley. We can take a slightly different route on the way out to pay a visit to the enchanting village of Sing Gomba. This high elevation settlement has its own cheese factory and monastery as well as marvelous views. We then descend through tranquil pine forests to the road a scenic ride back to Kathmandu. 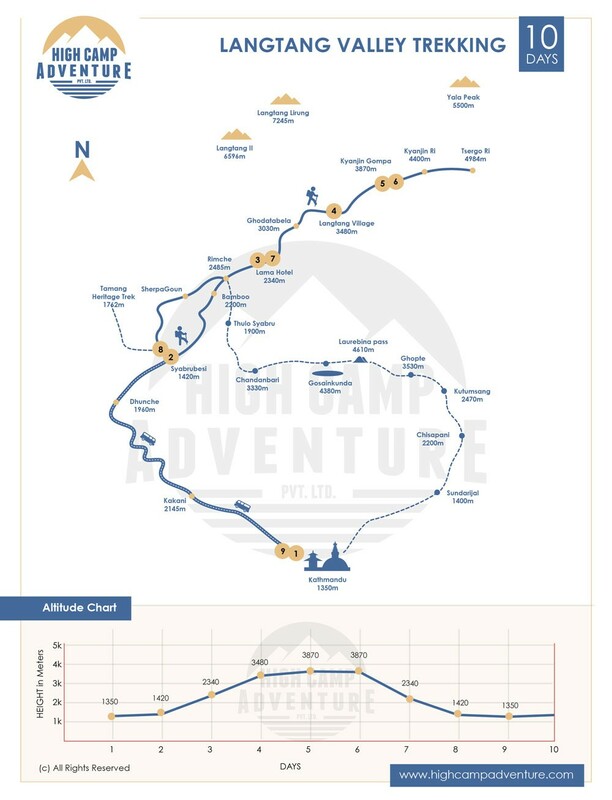 Please Note: Our Langtang Valley Trek has set departure dates from Kathmandu and this trek can be personalized to accommodate your specific wishes and timetable. We can arrange a combination of this Langtang Valley Trek with the Gosaindkunda, Helambu, and Tamang Heritage Trail treks for people with the time and interest as well as other inviting options in the area. Day 02Kathmandu to Syabrubesi (1420 mt.) by bus. Driving 7-8 hours .Overnight at guesthouse. Day 03Syabrubesi to Lama Hotel (2340 mt.). Walking 5-6 hours. Overnight at guesthouse. Day 04Lama Hotel to Langtang village (3480 mt.). Walking 5-6 hours. Overnight at guesthouse. Day 05Langtang village to Kyanjin Gompa (3870 mt.). walking 4 hours. Overnight at guesthouse. Day 06Exploration around Langtang valley (Langsisa Kharka, Kyangin Ri, Tserko Ri as per time permiting). Overnight at guest house. Day 07Kyanjin Gumpa to Lama Hotel (2340 mt.) Walking 6-7 hours. Overnight at guesthouse. Day 08Lama Hotel to Syabrubesi via Sherpa Gaon. Walking 5-6 hours. Overnight at guest house. Day 09Drive back from Syabrubesi to Kathmandu by bus. Overnight at hotel. Transportation to and from trek starting point. Day 2Kathmandu to Syabrubesi (1420 mt.) by bus. Driving 7-8 hours .Overnight at guesthouse.Our destination today is Syaphrubeshi. We start early on a local deluxe bus, which stops for breakfast and lunch on the way and brings us to Syaphrubeshi in about six to seven hours. This riverside settlement on the confluence of Bhotekoshi River and Langtang River has now become a favored trailhead. This is where we stop for the night. Day 3Syabrubesi to Lama Hotel (2340 mt.). Walking 5-6 hours. Overnight at guesthouse.Our walk to Bamboo, where we stop for lunch, starts out by crossing both the Rivers. We then walk on a trail that many should feel comfortable on the legs all the way along the banks of Langtang Khola. Bamboo awaits our arrival with a few teahouses. It is the Ganesh Himal that keeps many engaged. The walk up to Rimche and Lama Hotel after lunch is taxing, on an ascent that many find steep. Once in Lama Hotel, we check-in in one of the few lodges. Day 4Lama Hotel to Langtang village (3480 mt.). Walking 5-6 hours. Overnight at guesthouse.Leaving Lama Hotel in less than a quarter of an hour, today’s walk starts out through a subtropical forest with the Langtang Khola somewhere close all the time. As we continue to gain height, the vegetation changes to sub-alpine by the time we reach GhodaTabela, where we stop for lunch. Dal-Bhat is a filling option for many. Dal-Bhat does not just come with the Dal (a thick lentil soup) and Bhat (rice); it comes with at least vegetables and pickles and one can ask for some more helpings for no extra charge. After all, ‘Dal-Bhat-Power, 24-Hour’ is how the common saying goes. With Langtang Himal, Langtang Lirung (7245 mt. ), GosaikundaHimal in close proximity, the gentle ascent after lunch is a treat of its own. Once we arrive in Langtang Village, we check-in in one of the few lodges. Day 5Langtang village to Kyanjin Gompa (3870 mt.). walking 4 hours. Overnight at guesthouse.Once again, we start out today on a gentle uphill. However, as the air starts to thin a little at these heights, slow-and-steady is no more a cliché. Surrounded by these huge elevations, Kyanjin Gompa is nestled in a valley. With slightly less than two dozen constructions, the entire village, along with yaks, are up and ready to welcome its visitors as we reach the place. Many find the glaciers, rivers and the Himalayas all around fascinating for a closer look. We stop here for lunch, dinner as well as the night. Day 6Exploration around Langtang valley (Langsisa Kharka, Kyangin Ri, Tserko Ri as per time permiting). Overnight at guest house.Today is for a hike to Tserko-Ri, a vantage point at a soaring 4,984 meters. Around five hours up to a sharp incline and we finally come atop Tserko-Ri. The view is simply breathtaking and only the ones who have made it this far remain witness to this claim. A broad panoramic view that includes Yala Peak, Morimoto Peak, Kyunggari, Mt Ganchenpo, Mt Urkinmang, Mt DorjeLakpa, PangenDopku Peak, Naya Kang Peak LangtangLirung, Mt Kinshung and Mt Yubrato name a few leaves but every soul wondering. The sights Langtang Glacier and KyanjinGompa Village to the West simply add to this pampering. The walk back should take around three hours to most. Day 7Kyanjin Gumpa to Lama Hotel (2340 mt.) Walking 6-7 hours. Overnight at guesthouse.Today, we return all the way to Lama Hotel/Rimche. Most of us would find ourselves pacing a bit faster now that the route is mostly a gentle downhill. Stopping for lunch, once again, in GhodaTabela, we walk on, retracing our footsteps to Lama Hotel/Rimche, where we stop for the night. Day 8Lama Hotel to Syabrubesi via Sherpa Gaon. Walking 5-6 hours. Overnight at guest house.From Lama Hotel/Rimche, we take a different turn to Syaphrubesi, via Sherpa Gaon. Parts of the route, especially, to before Sherpa Gaon, demands careful attention as the slippery slopes look very inviting. Beautifully showcasing Ganesh Himal as well as other numerous mountains in the bordering Tibet, alpine Gaon, where we stop for lunch, is no miserly. We move on after lunch. The sharp downhill that follows almost all the way to Syaphrubeshi is the final hurdle for this trip. Once in Syaphrubesi, we check-in. Day 9Drive back from Syabrubesi to Kathmandu by bus. Overnight at hotel.Our return to Kathmandu is on a local deluxe bus, a ride that should last for around seven hours. With breakfast and lunch on the way, we traverse on narrow roads that meander from a hill to another. Arrival in Kathmandu and it’s certainly time for rest. Day 10Transfer to airport for your final departure from Nepal.Depending largely on your travel fixture, you will be leaving for Tribhuvan International Airport for your departure from Nepal either in the morning or in the afternoon or in the evening. Depatrure Note : Please take a look at our fixed departure dates for this trek. If they do not fit with your schedule, then please let us arrange an itinerary that is more suitable to you and your requirements. Langtang Valley Trek is a moderate trek which is fit for those who has the ability to walk 5-6 hours of walking uphill and downhill in a day carrying a personal day pack. Some days are longer with 7- 8 hours of walking as well. Langtang Valley Trek is high altitude trek which demands more physical, however having strong determination, positive vibe and average physical fitness can complete this trek. Some time mental aspect also plays a vital roll in an altitude. Doing some physical exercise a few weeks prior to the trip is better but technical skill is not required for this trek. If you are taking medicine for heart, lung or blood diseases, please kindly consult your doctor and inform to High Camp Adventure. Spring (March to May) and Autumn (September to November) are the best months for Langtang Valley Trek. Where normally days are sunny, the temperature is perfect, the sky is clear and Mountain remains crystal. This trek can be done in Monsoon (June to August ) but you should not expect the great weather and Mountain view. You can do it in Winter (December to February) if you are used to with extreme cold temperature.